The Center recently shared the stage at the National Center for Biological Sciences in Bangalore with Daisy Ginsberg and James King. They were in India helping mentor a group of artschool biohackers. We started talking to Daisy about her Synthetic Kingdom project. 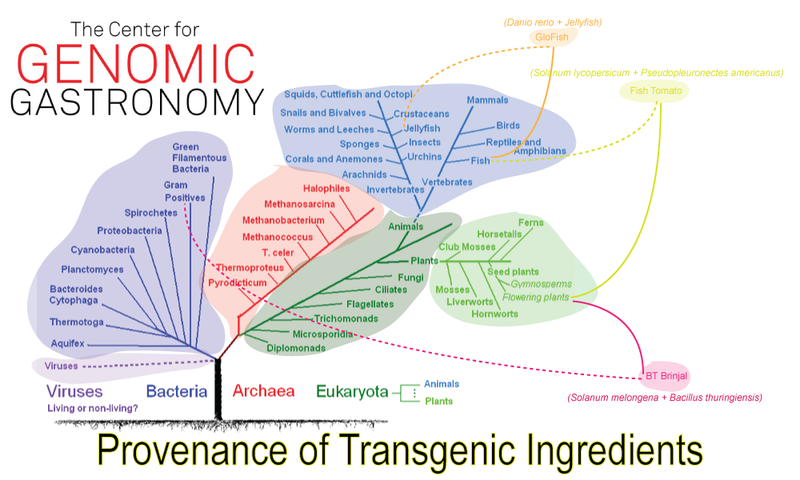 How would some of the ingredients we were studying at the Center be represented in her new proposed taxonomy? The Genomic Gastronomer is not only interested in the physical and chemical properties of an organism, but also a food stuff’s provenance. What are the cultural selection mechanisms and biotechnological affordances and biases that led to an organism’s current state and usage as a food? One way of starting to map the provenance of transgenic organisms is connecting the mother organism and the genes that are transferred horizontally into them. Here is our first attempt at such a map. It includes recent ingredients including BT Brinjal, the Fish Tomato and GloFish. Creating taxonomic and visualization standards would be particularly helpful in the ongoing research of the Center. One problem we have run into on Wikipedia is finding appropriate naming conventions for organisms such as the “Fish Tomato” which existed in a lab and in the cultural memory, but does not have a scientific or even commercial designation. At least a map of the phylum’s that are being connected is a useful start for tracing the provenance of the organism. On the other hand, the potential to hyperlink between articles HAS made it easy to reference The Winter Flounder in relation to the Fish Tomato. The Center looks forward to helping designers and scientists create spaces on the tree of life for the ingredients that we study and consume!